Focus and Fear of Success - The Biggest Monkey on Your Back? If you have been on the internet for awhile, you know that there are millions of people trying anything and everything to get your attention. They want in your wallet. It's a great big money grab out there folks, and the net has become the biggest marketing arena on the planet, driving whole industries and generating Billions of dollars in sales. So what's the problem? Well, none if you are one of the small businesses with focus. A whole lot of problems if you lack focus. There are myriad small business opportunities on the net today. And if you do your research and find something you want to associate with, or you create a product for a well-researched target market, you are well on your way to financial success. Or are you? The new "thing" demands your attention and you get nervous that you might be missing out on another opportunity for financial success. off the ground and profitable? positioning, you need a links campaign, you have to research ezines in your niche and place ads, you need to set up joint ventures, you need to create and update content on your site, set up a merchant account, a delivery system, and the list goes on from there. Then you get an email from a friend or associate telling you that you HAVE to check out the latest and greatest. You do. It's an awesome opportunity. You look at your plate and it's already full with your current project, but the plate has a lot of things on it you really don't enjoy doing. It's a lot of work to make any business pay off, as you can see from the short list above. "It's Much More Fun To Think About Success Than It Is To Do The Work It Takes To Achieve It"
But this NEW thing is exciting, fresh, new. It draws you in and it's MUCH more fun to think about success than it is to do the work it takes to achieve it, so you buy in. You get a ton of tools to start this new venture. It's all overwhelming, especially since you have gone back to your first venture and realized you now have TWO great things that can both make you money, but they BOTH need your attention on a grand scale in order to see profit. Now, here is the part where most people give up. They say to themselves "Internet marketing is nothing more than a series of steps that I cannot complete. I am always excited when I get started on something, but when it comes down to DOING what I start, it gets hard and doesn't happen as fast as I would like it to." Let me make one thing clear right now: It is not the net's fault for not providing us with real opportunity. computers and internet marketing than me." The problem lies with your focus and your fear of success. You must CHOOSE the opportunity you are passionate about, or create a product you stand behind and love, and then hunker down for the long-haul! Make yourself do everything you are taught to do to build your business and build it - all the way or not at all. It should be no surprise the next time you get an email with the next best thing inside. You should say to yourself "That's great! Another opportunity for someone has just been born! But I am busy with MY business and cannot take on another venture at this time." Lack of focus is sometimes a purposeful self-defeating tactic your subconscious uses to keep you from success. Success is NOT a destination. It's a journey. But don't let a lack of focus and your fear of success tear you away from your dreams. USE your fear and confront it, right now. Today. We all know there are tons of opportunities out there. That is a fact. It's time now to get the stars out of your eyes, choose your niche, your product, your affiliate program or your MLM, and get to work. Make a vow not to stop until you are where you want to be financially. The question is not "Can you really make money online?" This has been proven time and again over the years by thousands of people, many of whom you read about all the time. The question is "Do you really want to be one of those people, or are you stuck in a cycle of constantly sabotaging your success with a lack of focus?" The cure for Sign-up-itis is focus and hard work. Success is something you decide to achieve one day. It's that decision that is often the biggest hurdle any future success story has to conquer. 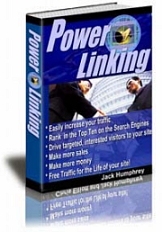 Jack Humphrey is the Author of "Power linking 2: Evolution"